How To Save Bandwidth While Playing YouTube Videos In Google Chrome? Almost every one of us uses the Internet these days, and for a variety of purposes. This includes everything from checking e-mail to downloading applications. But if there’s one thing that we all love doing more often than not, it’s watching YouTube videos. And why shouldn’t that be the case, because YouTube is, well, amazing. But watching tons of YouTube videos can lead to major bandwidth overages, which can’t be good, especially if you have a limited data plan. But it doesn’t have to be that way, as a simple Google Chrome extension, SmartVideo For YouTube, can help in conserving bandwidth while you’re glued to YouTube. Sounds interesting? Head past the break to find out how to save bandwidth while playing YouTube videos in Google Chrome. As illustrated by the above screenshot, SmartVideo features a bunch of settings, duplicated in two columns. 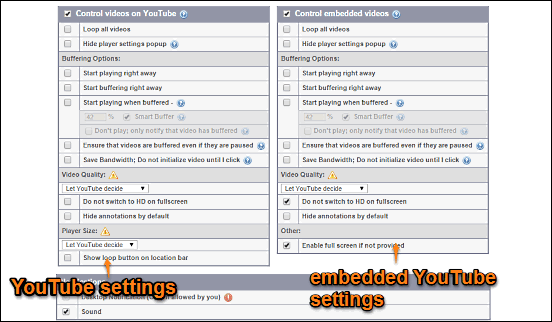 The left column includes settings for videos played directly on YouTube, whereas the right column features settings for YouTube videos embedded on other social media websites. Though, not shown in the screenshot, there are also some other settings below these two columns. These can be used to enable desktop notifications, and making changes to the way YouTube videos are played in playlists. That’s all there’s to it. You can now continue watching your favorite YouTube videos, as the changes you’ve made through SmartVideo will be instantly reflected. How cool is that? Also See: How To View CSS Of Webpages In Google Chrome? Watching YouTube videos is one of the most popular web-based activities, performed by almost all of us on a near daily basis. However, an excess of that can put up quite a stress on your network bandwidth. Thankfully, handy extensions like SmartVideo For YouTube are there to ensure that doesn’t happen. Try it out, you’ll love it.